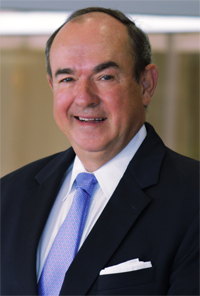 Carlos E. Evans was elected to the Board of Directors at the annual meeting in May 2016 and is Chairman of the Finance Committee and a member of the Compensation Committee. Mr. Evans retired from Wells Fargo Bank in May 2014, where he served as executive vice president and group head of the eastern division of Wells Fargo commercial banking. Mr. Evans was also responsible for the bank's government and institutional banking group and he served on Wells Fargo's management committee. Mr. Evans joined First Union National Bank in 2000 as the wholesale banking executive for the commercial segment prior to its merger with Wachovia Corporation in 2001. From 2006 until Wachovia's merger with Wells Fargo in 2009, Mr. Evans was the wholesale banking executive and an executive vice president for the Wachovia general banking group, overseeing the commercial, business and community banking segments, the dealer financial services business and the government, tax exempt and not-for-profit healthcare groups. Before joining First Union, Mr. Evans served in a variety of roles at Bank of America and its predecessors including NationsBank, North Carolina National Bank and Bankers Trust of South Carolina, which he joined in 1973. Mr. Evans received his B.A. in economics from Newberry College. He is also a graduate of the Commercial Lending School in Oklahoma and the Colgate Darden Commercial Lending School at the University of Virginia. Mr. Evans is chairman emeritus of the board of the Spoleto Festival USA and chairman of the board of the Medical University of South Carolina Foundation. He is also on the boards of Queens University of Charlotte and three private companies, National Coatings and Supplies Inc., American Welding & Gas Inc. and Johnson Management.